His name was Edward. Her name is Elaine. Edward was a hard-working, successful businessman. He founded a company that built and sold high-end custom pool tables that were so beautiful and well-built that many of them still grace homes in northern California today. Edward fell in love with a young woman named Elaine. They were one of the fortunate couples that not only celebrated a Golden Anniversary, but even made it to that rare 60th wedding anniversary. That was a marriage that almost didn’t happen. Edward volunteered to join the Navy out of high school, but due to his poor eyesight was disqualified from front-line service. Instead he worked as an orderly in a Utah Army hospital. In fact, Edward was the only member of his high school gymnastics team that didn’t join the Navy in July 1941. Tragically all of his teammates were killed at Pearl Harbor aboard the U.S.S. Arizona. Edward’s life was spared. 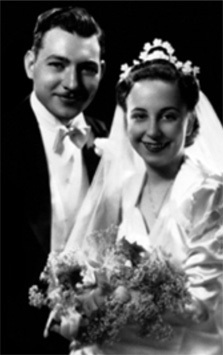 After uttering his first words to her in June of 1944, “So where have you been all my life?” Edward and Elaine eloped and were married just one month later in July. After the war, their marriage and business thrived. Despite their busy professional demands, they went to church every Sunday without fail and made sure that all three of their rambunctious sons went as well. We are proud to say that we are apart of Edward & Elaine’s prosperity and we have tried to follow their example of provident living and being good to all. Dad had a wonderful life but the last few years were challenging. The reason we wrote this Special Report is so you and your family don’t have to face the same problems Edward and Elaine did. For those of you who don’t know us, we are David and Todd Phillips. Together we have over 65 years of experience working in the financial and investment universe and through the years we have been advocates, even designers, of many of the innovations the industries have introduced. In the late 1980’s, predicting the huge impact long term medical expenses would have on the World War II generation, some insurance companies got creative and designed Long Term Care Insurance. Being a believer in the concept of Long Term Care Insurance, we purchased one of the first plans for Edward and Elaine. In 1999 Dad was diagnosed with Alzheimer’s, and while we were all extremely distraught over the news, we were comforted knowing that there was a long term care policy in place. We sold the Sacramento, California family home of 45 years and moved Mom and Dad closer to our families in Arizona. This way we could help take care of him if needed. As is usually the case with the disease, Dad progressively got worse. Over the next four years, Mom doted on Dad and was the primary care giver. Both our families helped out for as long as we could. It wasn’t until the last years of his life that Hospice Inspiris came to their home for four hours a day, twice a week. The hospice caregivers were angels and Mom was able to leave Dad’s side with the confidence that he was in good hands. They would bathe, dress and feed him. What a blessing that was. Even though Dad was eventually incapable of performing any of the normal activities of daily living, he never qualified for any benefits from the long term care policy we bought him. Why not? To qualify, Dad had to be admitted into a nursing home as a permanent resident. No one really wanted that, especially Mom. On August 17, 2005 Edward Phillips peacefully passed away after only being in an assisted living facility for one week, not a nursing home. Even though we had paid all his premiums for years and he was suffering from Alzheimer’s, his long term care benefits were never triggered and his policy never paid out a dime of benefits. The thousands of dollars we had paid were gone! Granted, with Mom and Dad’s policies we had purchased some peace of mind. But financially speaking we lost the bet with Dad’s policy and Mom is still going strong at 89, so we’ll most likely lose that bet as well. With all the resources and creative minds in the insurance industry we couldn’t help but think they could come up with a better alternative. One that provided the much needed funds to cover long term medical expenses, but didn’t require entering a nursing home to trigger the benefits. A plan that would return the premium, if the LTC benefit was never activated. One that would supercharged a financial legacy should you dodge the LTC bullet. We are excited to report that we have found such an alternative and encourage you to consider it as the foundation of your long-term financial plan. We call it LEGACY CARE – SURVIVORSHIP II. According to a recent USA Today article there is a 91% chance that one member of a married couple will need long term medical care. It is further reported that 70% of those over age 65 will need some type of long term care medical services at an average total cost of $250,000. We have all seen the debilitating effects of a long term medical situation, not only for the one suffering but the family care givers. Unintentionally the patient requires so much attention that living a normal life for those involved stops until the care is no longer needed or changes hands to a professional facility. In an effort to head off the financial calamity caused by long term care, the insurance industry created Long Term Care Insurance (LTCI). For multiple reasons the public was slow to catch the vision and a relatively small number signed up. Because the risk pool was tiny by comparison, when claims began to pour in, carriers had to increase premiums and make entry available to only the super healthy. The net result is that while statistics are clear in that the vast majority of us will need long term medical care (80% of women over 65), only a select few are insured. Another concern is that the stand-alone LTC insurance is a “use it or lose it” proposition. No one likes to pay for something when the only way of recouping their payments is a tragic event. Car insurance, home owners insurance and Term Life insurance are that type of risk management product. While needed and sometimes mandated by law, paying premiums is a pain. So what are your options with regard to insulating you from inevitable long term medical expenses besides a stand-alone LTC policy? SELF INSURE – With this approach you set aside specific dollars from your investments to take care of future potential long term medical expenses. If you elect this route you must keep these dollars in a safe harbor – out of harm’s way. With self insuring, when the money is gone, it is gone forever. So if you go this route, set aside plenty of money for both of you. LONG TERM CARE ANNUITIES – We have written multiple articles about this recent invention of the insurance industry and have extolled its virtues. Rather than hording your long term medical fund in a CD or an old annuity, transfer the money into an annuity that doubles as a tax sheltered wealth accumulation vehicle and a Long Term Care policy that increases the annuity value up to three times if you trigger the LTC benefit by not being able to perform two of six ADL’s or by becoming cognitively impaired. The income Tax-Free payout increase is paid out over a period of time ranging from 60 to 90 months. You decide up front and payments begin 90 days after diagnosis, when Medicare ends. Besides taking the worry out of providing for long term medical expenses; the Long Term Care Annuity provides a NON “use it or lose it” proposition. Should you dodge the LTC bullet, your annuity plus any interest earnings pass to your designated beneficiaries. HYBRID LIFE/LTC COMBO STRATEGY – Another option that is gaining in popularity is the Hybrid Life/LTC Combo Strategy. With this option, when triggered, the Tax-Free Long Term Care benefit is extracted from a life insurance benefit at the rate of 2% per month for 50 months. The balance of any unused life insurance benefit passes income Tax-Free to your beneficiaries. The life insurance and LTC benefits are immediate and perpetual, thus significantly increasing your estate. Upon approval, the instant life insurance benefit will always be multiples of your deposit, (see Table 1). For example, a 65 year old male in good health depositing $100,000 will create an immediate increased estate of $291,300, with a monthly LTC benefit of $5,826 for 50 months. A 70 year old female depositing the same $100,000 will increase her family’s inheritance to $259,353 while providing a monthly LTC benefit of $5,187. This approach has particular appeal for those that want to guarantee a financial legacy to their posterity while at the same time taking care of potential LTC expenses. One additional feature of the top Hybrid Life/LTC plans is that they provide a Cash Indemnity LTC benefit. Meaning that once qualified, the monthly benefit is paid out Tax-Free directly to the policy owner without having to prove that care took place. To meet regulatory requirements for tax free LTC benefits, a Plan of Care must be submitted when the claim is filed, but in general, the carrier will not place restrictions on how benefits are used, which means informal caregivers and immediate family members can provide care. So in Dad’s case, had he owned a Hybrid Life/LTC policy, Mom would have received a monthly benefit payment once the Alzheimer diagnosis care was rendered. Another advantage of the Cash Indemnity approach is that the policy owner is in full control of how the monthly LTC benefits are spent. The cash benefit can be used as needed for items or services such as home modifications, transportation, prescriptions, etc. Furthermore, payments are made without permission from the carrier and without submitting receipts for reimbursement. With the Hybrid Life/LTC Combo approach you can set up your plan on an annual premium basis as opposed to making a single lump sum transfer like the LTC Annuity. This especially works well for those who want to continue aggressively investing their assets, lack the cash flow for a lump sum or simply want to create as much leverage as possible. FAMILY BANK STRATEGY WITH LTC - Another option with the Hybrid Life/LTC Combo is to not only create an instant increased estate with the life insurance benefit, provide an immediate increased LTC fund, but to also build a robust Tax-Free cash accumulation account using the favorable tax codes afforded permanent life insurance. We call this approach The Family Bank Strategy. We recently wrote a book by that name and it is available by calling our office toll free 1.888.892.1102. The cash account can be accessed through the years without cost and taxes and can be used for education, financial opportunities, emergencies, monthly income, etc. When structured as a combo plan, the life insurance benefit will pass to your beneficiaries or will be used for your LTC expenses. This creates a unique 3 in 1 multi-dimensional approach to taking care of LTC. Many deposit their unused IRA Required Minimum Distributions to fund this approach. In addition many transfer IRA funds into the Family Bank Strategy rather than to a Roth IRA because, not only does your interest accumulate income Tax-Free, you have the augmented Tax-Free life insurance and long term care benefits. Whereas a Roth is only worth what a Roth is worth. Furthermore, The Family Bank Strategy is considered a “safe money investment,” a good alternative to your “at risk” options. The latest innovation in the Hybrid Life/LTC universe became available in most states on October 12, 2015 and there’s no doubt that the company that created this new blockbuster hit a home run. Since the early 1980’s, with the introduction of the unlimited marital deduction – which basically transferred the responsibility of paying federal and state death taxes from the surviving spouse to the children – a number of major insurance carriers have offered permanent Joint & Survivor (JLS) life insurance as a more affordable option to acquiring individual permanent insurance. Also known as “Second to Die”, it provides Tax-Free cash liquidity to your heirs upon the passing of the surviving spouse. Because of the delayed life insurance benefit distribution a significantly smaller capital transfer (premium) is required versus two individual policies totaling the same amount of protection. The net result is greater total coverage for less premium, or a lower overall cost of insurance. This bodes well for those that want to create maximum leverage for as little as possible or Family Bank Strategy cash accumulation style policies that want the cost of insurance to be the lowest possible. Using that same JLS discount pricing philosophy, Nationwide Life Insurance Company (AM Best Rated A+), one of the country’s most stable companies, just created the most cost effective Hybrid Life/LTC Combo policy to date. The official name is Nationwide YourLife No-Lapse Guarantee SUL II, we call it Legacy Care - Survivorship II. Julie and Stephen from Seattle, Washington, both age 65 are in good health and have been considering establishing the Hybrid Life/LTC Combo Strategy. They have two children and five grandchildren. They are concerned that an extensive long term illness would not only erode their assets it would be a financial hardship on each other. They want to continue taking risk by investing their IRA in the market and they want to make sure that there is sufficient instant and perpetual liquid cash from other assets to pay any income taxes and state inheritance taxes that could be levied on the children if they inherit any remaining IRA funds. They also want to leave a guaranteed financial legacy to their children and grandchildren regardless of how their investments perform or how much they spend through the years. During their research they thought that two individual Hybrid Life/LTC Combo policies for $500,000 each would be a good way to leverage a CD they had set aside for a potential long term medical crisis. The annual premium for Nationwide’s NLG LTC policy for Julie was $10,385 and $12,028 for Stephen, for a total yearly premium of $22,413. With the introduction of the Legacy Care - Survivorship II, they discovered that they could generate much better leverage. For the same $1,000,000 of total liquidity, and the same $10,000 monthly LTC benefit EACH for 50 months, the annual premium would be $17,926 per year – 20% LESS! A hefty annual savings of $4,487 per year. Legacy Care - Survivorship II is unique not only because it provides a Long Term Care benefit for both insureds, it is also the first policy of its kind that allows for the insureds to be simply two individuals with an insurable interest. This includes: insuring a parent with a child, business partners and domestic partners. Jill, 45 an Colin, 46 have been married 20 years and have two children. They have a good size retirement plan and want to leave a financial legacy to their children. Jill’s mother Lillian age 70, is a widow who hasn’t planned for her own long term care needs. Jill knows that if the day arrives that her mom needs long term medical care, the responsibility will fall upon her shoulders. Jill and Colin deeply love Lillian, but they don’t want to see their retirement nest egg nor their children’s inheritance eaten away. Jill is also concerned about her own long term care needs and would like to leave a guaranteed inheritance to her children and future grandchildren. 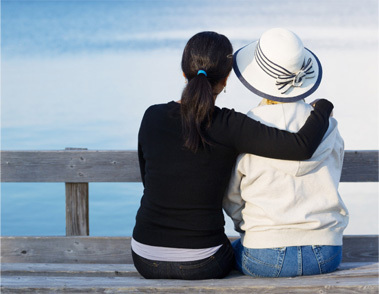 THE SOLUTION: Secure Legacy Care - Survivorship II for $500,000 insuring both Jill and Lillian with an annual premium of $7,036 funded in part by the inheritance Lillian received from her late husband. THE RESULT: Lillian will have a Long Term Care benefit of $5,000 per month for 50 months as will Jill and there will be a $500,000 life insurance benefit that, if unused for LTC will eventually pass to either Colin or Jill and Colin’s children…..Lillian’s grandchildren. This approach is logical, affordable, meaningful, and makes perfect economic sense. The reverse approach could work as well. Let’s assume that Lillian is relatively well off and Jill is a single parent struggling to raise her two sons. Both would like long term care coverage. Lillian would like to preserve her assets for her daughter and grandchildren. Jill would like to guarantee that she will not become a financial burden to her children later in life because of a long term medical situation. Both also see the wisdom of creating a $500,000 legacy for their posterity with any residual life insurance benefit. By acquiring the Legacy Care - Survivorship II they both can rest at night knowing that should the LTC bullet hit they each have a $5,000 monthly Tax-Free benefit. Legacy Care - Survivorship II LTC benefit is paid out as a Cash Indemnity benefit, without proof of expenses or receipts. Nationwide however, takes its’ claim payment one giant step further by allowing benefits to be paid to the insured in any non third world country just as long as a US licensed practitioner validates the insured’s disability and establishes a plan for care. Another superior feature unique to Nationwide’s Hybrid Life/LTC Combo policies is the residual life insurance benefit that is provided on all plans, including the Legacy Care - Survivorship II. If your life insurance benefit initially is $500,000 and both insureds use it up in long term medical payments of $5,000 per month for 50 months, your beneficiaries will still be left with a life insurance benefit that is 10% of the initial face amount up to $50,000. This safety valve can provide the much needed guaranteed cash for final expenses. The maximum age for the Legacy Care - Survivorship II is 75, while other plans are available to age 80. Traditional underwriting is required including a complimentary paramed exam in the comfort of your home or a local clinic. Where else can you place your investable assets and receive these kinds of benefits? There is nothing like it anywhere. $100,000 in a CD, money market account, or even a mutual fund is worth $100,000, nothing more. With the Hybrid Life/LTC Plans you have so much more, and definitely more peace of mind. ACTION ITEM: Pick up the phone and call our office today for a brief suitability review. Next you will want to submit an application to see if you can qualify. Call today while you are thinking about it at 1-888-892-1102. You can also complete the attached Getting Started Is Easy illustration request form or visit us online and make your request by logging on to: www.epmez.com and go to the Hybrid Life/LTC tab. Cable TV, car payments, dinner for two, home owner’s insurance and traditional Long Term Care insurance are examples of an expense. Something we have to budget for. Hybrid Life/LTC Plans are, simply put: An asset transferred – from your left pocket to your right pocket. When you list your assets on your balance sheet, your Hybrid Life/LTC Plan will be on the left side of the ledger. A positive entry. Decide on the amount of coverage you would like to review. Once we receive your request and after a brief telephone suitability review, we will forward your personalized illustration, carrier brochures and Application Kit.